Weigh in on the roads you think are important in Olympic National Forest! Do you spend time in Olympic National Forest? Are there areas you feel are important to be able to access? Places that are harder to access because a road has been closed? Olympic National Forest is seeking input on identifying a sustainable road system – weigh in! The Olympic National Forest is hosting open houses asking the public to share the areas and roads they use on the Forest. This information will help the Forest identify a financially sustainable road system that meets diverse access needs, minimizes environmental harm, and is safe and dependable because it is scaled to available resources. Your participation will help us understand your access needs,' said Forest Supervisor Reta Laford. 'It would be particularly helpful to know what areas you use on the Forest and what roads you use to get there. 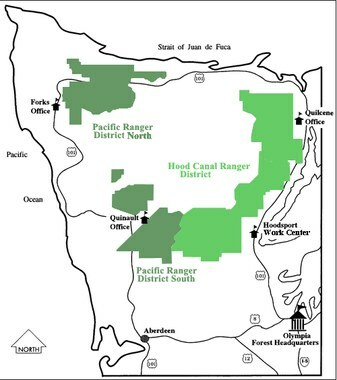 The open houses will be held around the Olympic Peninsula during the summer of 2014. Port Angeles – Clallam County Courthouse, County Commissioner’s Meeting Room • 223 E 4th St.
Forks – Olympic Natural Resources Center, Hemlock Forest Conference Room • 1455 S Forks Ave. Port Townsend – Port Townsend Community Center • 620 Tyler St.
Quinault – Olympic National Forest, Quinault Ranger Station • 353 South Shore Rd. Shelton – Shelton Civic Center • 525 West Cota St.
Aberdeen – Rotary Log Pavilion • 1401 Sargent Blvd. In addition to attending open houses, the public may provide comments using the web-based map or on-line questionnaire on the Forest website. Questionnaires are also available at any Olympic National Forest office. Comments will be taken until August 31, 2014.